EagleSpeak: Energy: "New Gas Extraction Methods Alter Global Balance of Power"
Energy: "New Gas Extraction Methods Alter Global Balance of Power"
Of the natural gas consumed in the United States in 2011, about 95% was produced domestically; thus, the supply of natural gas is not as dependent on foreign producers as is the supply of crude oil, and the delivery system is less subject to interruption. 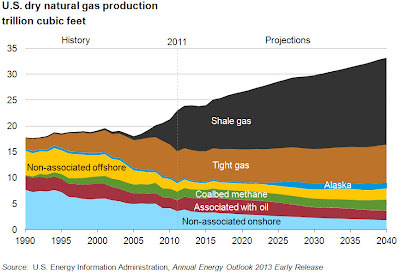 The availability of large quantities of shale gas should enable the United States to consume a predominantly domestic supply of gas for many years and produce more natural gas than it consumes. The gas revolution is changing the political balance of power all over the world. Americans and Russians have waged wars, and they have propped up or toppled regimes, over oil and gas. When the flows of energy change, the strategic and military calculations of the major powers do as well. It is still unclear who the winners and losers will be. The Chinese and the Argentines also have enormous shale gas reserves. Experts believe that Poland, France and Germany have significant resources, although no one knows exactly how significant. Outside the United States, extraction is still in its infancy. The outlines of a changed world order are already emerging in the simulations of geo-strategists. 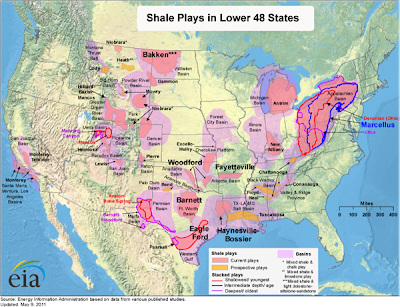 They show that the United States will benefit the most from the development of shale gas and oil resources. A study by Germany's foreign intelligence agency, the BND, concludes that Washington's discretionary power in foreign and security policy will increase substantially as a result of the country's new energy riches. According to the BND study, the political threat potential of oil producers like Iran will decline. Optimists assume that, in about 15 years, the United States will no longer have to send any aircraft carriers to the Persian Gulf to guarantee that oil tankers can pass unhindered through the Strait of Hormuz, still the most important energy bottleneck in the world. The Russians could be on the losing end of the stick. The power of President Vladimir Putin is based primarily on oil and gas revenues. If energy prices decline in the long term, bringing down Russian revenues from the energy sector, Putin's grip on power could begin to falter. The Americans' sudden oil and gas riches are also not very good news for authoritarian regimes in the Middle East. Now, who benefits from open sea lanes on which the U.S. could export LNG? Why just about everyone! Except, of course, for the Russians and the Middle East maybe. Who keeps those sea lanes open? The U.S. Navy. 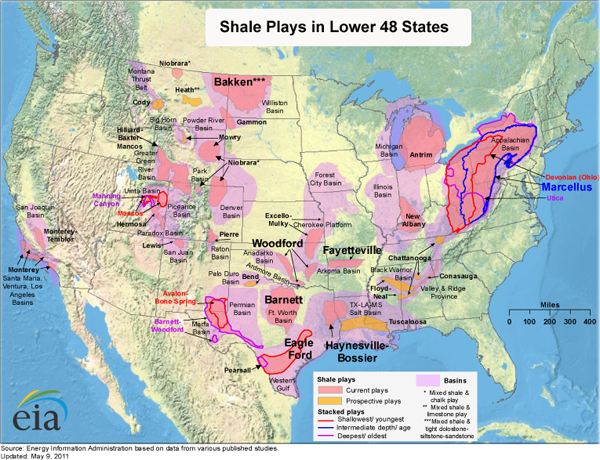 Who should we lend a hand to in exploring their potential for shale gas? Poland, Germany, France? China? Argentina? Australia? What about Japan? It stands to benefit from an open sea lane to receive LNG (liquified natural gas) from the U.S. and other places. See Issues Facing U.S. Shale Gas Exports To Japan.